Cypress Creek is located just north of Austin in Cedar Park. This area of Texas is fast-growing, but the campus feels like a small town. Friendly faculty and staff will help you get where you want to go. Students at Cypress Creek can enroll in career-technical classes or choose from a variety of general education courses that transfer to universities. Cypress Creek provides a full range of support services to increase your success in the classroom and beyond. You’ll find a library, learning lab with free tutoring, and testing center. M-F: 7 a.m. – 10 p.m.
M-F: 7:30 a.m. - 9 p.m.
Student Commons The Student Commons provides a comfortable setting to relax and socialize between classes. Science Labs State-of-the-art science labs aid your studies in physics, chemistry, and more. EMT - Basic Basic emergency medical training classes for quick career entry and the first stop to the Emergency Medical Services Professions Program. Turn right on Round Rock Avenue (RR 620), go 1.7 miles. RR-620 becomes FM 620, go 2.9 miles. Turn right on South Bell Boulevard, go 2.6 miles. 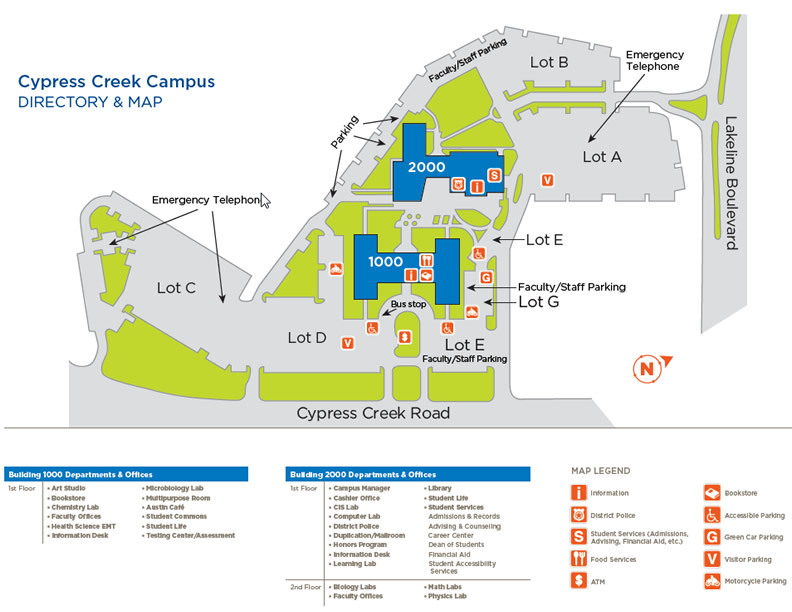 Turn left on Cypress Creek Road, go 1.8 miles to the Cypress Creek Campus. Take Exit 240B onto U.S. 183 North, 9.4 miles. U.S. 183 North becomes Research Boulevard, go 2.5 miles. Research Boulevard becomes South Bell Boulevard, go 2.6 miles.